Sure, Mad Men served up sartorial inspiration aplenty, but our favorite came when Don Draper would open his bottom desk drawer at work after a night of philandering to reveal a stash of crisp white dress shirts. Ahhhh. Good outfits are like works of art, and a clean white dress shirt is one of the best canvases. In this guide, we’ll break down what you need to know to find your perfect white dress shirt (or maybe even a drawerful). While it may not hide all your vices, it will might make them a bit easier to ignore. Shopping for the perfect white dress shirt can be every bit as painful as shopping for the perfect white paint. There’s so much to choose from! As with picking the right hue for your bathroom walls, the secret to shopping for the perfect white dress shirt is to keep things simple. Stick to 100% cotton. It’s going to be the most durable and the most breathable material by far. If you’re a pretty muscular guy, a little bit of stretch can be helpful, but no more than 2% of a stretch material. Why? Well, over time the plastics used to give fabrics stretch will break down faster than cotton, causing the broken fibers to poke out of the shirt. Pinpoint is woven with thinner threads than oxford cotton (which we’ll get to) for a resulting smoother hand. Cotton woven in an end-on-end weave with contrasting warp and weft threads. The result is a heathered look to the fabric. A cotton poplin shirt works well all-year round but really shines in summer. Cotton is known for its light weight and comfort, but the plain over/under weaving technique used to create poplin dresses up this typically casual fabric, giving it a crisp look that feels silky to the touch. 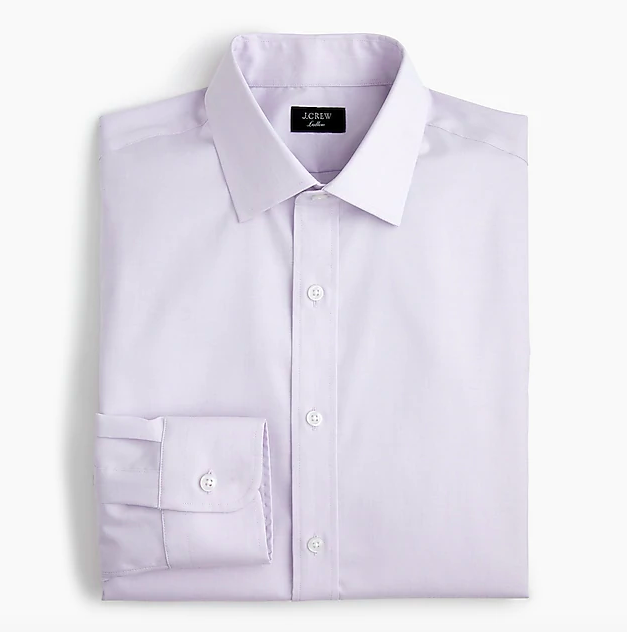 Poplin’s weave also makes shirts less likely to wrinkle – but it is easy to iron if you did accidentally ball it up and throw it in the bottom of your closet. Ultimately, poplin and broadcloth tend to be the most widely-worn for dress shirts. Not all shirts with buttons up the front are formal enough to qualify as dress shirts. You probably have quite a few “sport shirts” that are more casual in your closet. You know when to wear these: on the weekends, with jeans, shirt untucked. Pre-washed and, worn- in shirts, these shirts are comfy, and often stylish! But they don’t have the crisp look and feel of a dress shirt meant to be worn with a suit or suiting separates. You don’t want to find yourself in need of a formal dress shirt and have to wear a rumpled sport shirt hanging in your closet, throwing off your whole “dressed up” vibe. A crisp white dress shirt classes up almost every look. Obviously it looks right at home with a suit, but pairing a white dress shirt with dark rinse jeans and white sneakers can also instantly elevate your date night look. A white dress shirt with grey dress pants and a navy blazer is a classic office look that shows you mean business without taking yourself too seriously. The fit of a dress shirt should be close to the body without being restrictive. Aim for enough room in your shoulders and sleeves to cross your arms with ease. When you stand still, none of the buttons should strain. When considering the length of a dress shirt, know it should be longer than your casual shirts so that it stays tucked in (yes, this means it would look dumb with the shirttails hanging out…so don’t do that!). You should be able to comfortably fit your index finger in the collar, and the sleeves should fall where the thumb meets the wrist. Plenty of cuff options exist, but for a classic, wear-it-everyday white dress shirt, button or “barrel” cuff is the way to go. It’s clean, simple, and you don’t have to buy extra hardware just to wear your shirt. Make sure the cuffs fit around your wrists with enough room to fit your pinky or a nice watch. We’re more of a “cufflinks should be reserved for special occasions” rather than an everyday vibe, so do with that what you will. When searching for the right fit always remember: as long as the neck fits, a tailor can fix a lot. Sleeves can be shortened and sides can be taken in with ease so don’t stress too much if you can’t find a perfect fit right off the rack. Here at SG HQ, we have a confession to make: men’s dress shirt collars are a bit of a mystery to women. Just like you don’t fully appreciate the subtle – yet significant! – difference between the blush pink of Essie’s Ballet Slippers to the pink-y blush of Spaghetti Strap (yes, their real names), not all of us are totally clear on the intricacies of a point collar versus a cutaway. But we do, of course, and we know the number of collar styles can get overwhelming, even for guys. Are you sporting the right collar for your face and for where you’re headed? There are dozens of different kinds of collars, with styles for every imaginable occasion and face type. A versatile collar, though it takes some confidence to pull off – it looks good as a solid or a print and can be dressed up or down. The cutaway collar is short and is best paired with a tie boasting a wider knot. The button down collar is one of the more casual styles (and the one women most often call your shirts with buttons). It can be worn with or without a tie. There are two buttons on each side of the collar that, as tradition dictates, should be buttoned at all times, though I feel that’s a bit of an old-fashioned view. The distance between the two points of the collar is spread further apart than other collars – hence the name. This widespread collar enjoys widespread popularity, and for good reason. A note on fit: a spread collar looks especially nice on men with narrower faces. Originating in the 19th century, the club collar was worn by members of an exclusive club. Years later this rounded collar is considered a more casual style and is often worn to play golf. You can look like a bit of a dandy in this collar type, so if you’re going to go with it, proceed with caution and wear with care. The forward point collar – or simply, the point collar – is considered a staple in the business world. It especially flatters men who have round faces because of the narrow opening. Wear this style collar with a suit and tie or a sports coat. The shirt’s collar should be proportionate to your build and big enough to accommodate a tie. There are a number of collar options available; your default best bet is going to be a spread collar shirt. It will look just as good with a tie as it will without one. What about other kinds of shirts? 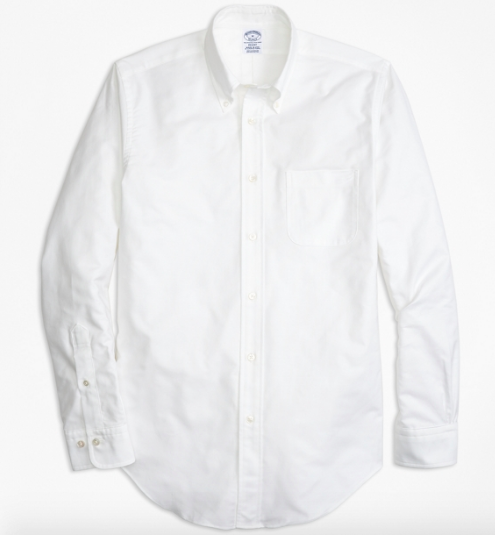 Every guy should have at least one white dress shirt – it’s basically the professional version of a plain white tee. From there, the sheer variety you can get between fabric, collar, cut, cuff and more means dress shirt shopping is either exhilarating or daunting. Here’s a guide on how to incorporate more colors and patterns into your wardrobe, which (hopefully) is helpful to guys feeling option overload! SG Says: Don’t be afraid to let your accessories do the talking. We love a loafer (especially one with tassels! SG Says: Given the more casual nature of this look, a sturdier white oxford shirt would be great here. Wear the bomber jacket open or only zipped halfway. SG Says: Make sure to treat shoes like these before you go out in bad weather! SG Says: This would be a great outfit for a summer-ready poplin white shirt. Tuck it in to show off a fun woven belt. Looking for more ways to wear your jean jacket? We’ve got you. SG Says: Cuff the chinos and go sockless now, but add fun socks when it starts to get cooler. 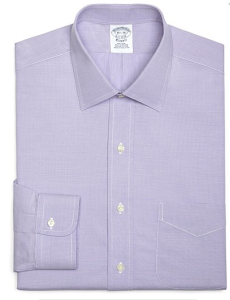 SG Says: Okay, yes, this Purple Label Ralph Lauren poplin shirt is a splurge at $350, but if you can afford it, go for it. If you’re looking for more of a ‘save’ than a ‘splurge,’ check out Everlane’s version. At $50, it’s considerably more affordable and also looks great. SG Says: We were psyched when The Tie Bar, purveyor of surprisingly affordable and even more surprisingly stylish ties, expanded into shirting. Their pinpoint dress shirt, at just $55, is a steal at twice the price. SG Says: Business Insider agrees with us that this Brooks Brothers Golden Fleece style is the top of the tops. SG Says: This is a sport shirt, so wear it with more casual outfits accordingly. And yes, it’s another Brooks Brothers style. What can we say? They know their button-ups! P.S. Is this all totally overwhelming still? Then you might want to shop with Team SG! Let us rescue you from shopping fatigue and sartorial apathy. Work with us to style upgrade ya, and we promise you’ll get a promotion at your job…No, just kidding. We obviously can’t promise that. But we can promise the kind of personal attention and care that will make you feel like the best version of the awesome guy you already are! If you’re ready for a lewk to change your life, or simply jump right to the end of the shopping process, give us a shout.